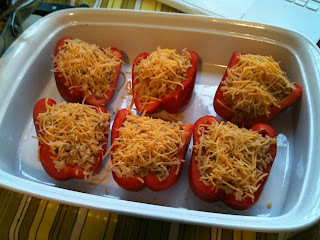 The original recipe for this dish comes from Gina's Skinny Recipes. This gal has a great blog where she posts a new recipe almost every day and she includes the weight watchers info for each dish for those who are counting points with that system. 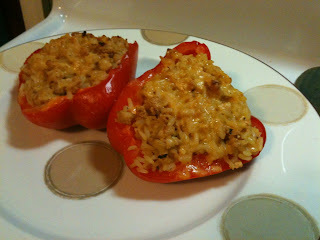 I really liked her take on stuffed peppers - she suggested cutting the peppers length wise, which I thought was great because it made the peppers easier to cut up and eat with out loosing a bunch of the filling. The other great thing about her recipes is that you stuff the raw peppers with the filling, then you add 1/2 cup of chicken broth in the bottom of the pan, cover it with the foil to cook, which ends up steaming the peppers. Heat oven to 400 degrees. Cook rice according to directions on box. In another pan, saute onion, garlic and parsley for about 2 minutes and add ground turkey. Add spice mix and cook for several minutes until meat is completely cooked through. Add 1/4 cup of tomato sauce and 1/2 cup of chicken broth, mix together and cook on low for 5 minutes. Combine cooked rice and meat together. 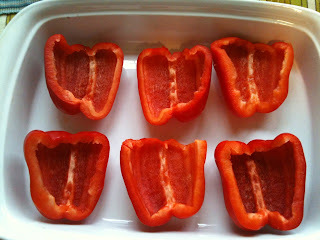 Cut the peppers in half lengthwise, and remove all seeds. Place peppers in backing dish and add meat mixture into each pepper half and fill it with as much as you can. Sprinkle each pepper with cheddar cheese. Pour the remaining 1/2 cup of chicken broth on the bottom of the pan. Cover with aluminum foil and bake for about 40 minutes. The finished product - Enjoy! Today I conquered one of my fears and ran 3 miles in the snow. So, given this accomplishment, I declare myself a true runner. Winter running can be extremely intimidating and with this being my first cold weather running season, I was totally freaked out about running in the cold, snow and ice. I did end up joining up with the running group to get ready for the Flying Pig Relay and that got me out for a run earlier this week. They also met on Saturday mornings, and tomorrow is supposed to be something ridiculous like 5 degrees. While I'm excited to be getting back out there with the girls, I'm not all about lacing up my shoes for that type of cold weather run. So, when I left work today and saw the sun shinning, I got a big burst of ambition and challenged myself to get out there today and do my 3 mile run when the temps were around 15 degrees and it was a bit warmer than it will be in the morning. It may not have been my fastest 3 miles and I may not have had the best form, but today I got out there in about 5 inches of snow and just did it. I layered up in some cold weather running gear and like Nike says, I said to myself - "Just Do It" - so I laced up my shoes, headed out the door and before I knew it I was half way through the run. Overall, it was not nearly as bad as I thought it would be. With the snow packed down, it was almost like running on sand just much colder and instead of hearing the ocean waves all you can hear is your shoes squeaking down as they pack down on the piles of snow, which is pretty freaking cool! No matter what it is, no matter how many time you've talked yourself out of it, no matter how much you don't want to, no matter what the out come - at least you will have tried and most likely succeeded at accomplishing your goal - just like I did today with completing my first run in the snow! In an effort to make adjustments towards a healthier lifestyle, I've been looking for some meatless recipes. Many websites & blog promote "Meatless Mondays" and offer lots of suggestions on how to make the switch, which is helpful to get more ideas other than pasta & salads. Preheat oven to broil setting. On medium heat, saute mushroom caps in some olive oil on for about 5-10 minutes, flipping the caps to cook on both sides. Place mushrooms in baking dish and fill the caps with marina sauce, spinach, feta & shredded mozzarella cheese. Broil in oven for about 10 minutes or until cheese is melted. This is a very informal recipe - I didn't do any measuring of the ingredients, so just go with the flow on this & fill the mushrooms with whatever amount looks good to you and bake them up. I'm sure you could also bake them on 375, but I like the cheese a little browned, so the broiling them worked out great for my tastes. If anyone has any suggestions for meatless meals, I'd love to have your recipes. One good thing for me is that JJ will eat anything, so that's great to have someone who's up to trying new things. I am the one with the less than adventuresome taste buds, but I am trying to expand my palate and have done so in the past few years. I feel this challenge will help push me beyond my comfort zone when it comes to food. Just this weekend we enjoyed a night out at some friends house and I tried some chili with beans, so that was a big step for me. I didn't eat all the beans, but a few snuck in and it wasn't too bad! So, suggestions and thoughts on this topic are welcomed. Let me know what types of meals you & your families are eating this year! JJ has already laid claim on the shortest distance - leg 2 - but what he may not be aware of this that particular leg is pretty hilly. The "upside" (pun intended) to choosing this leg is that it goes through the Hyde Park neighborhood, which is well known for being a place where tons of people are out cheering on race runners. After talking with him the other day, he now says he really doesn't care which leg he gets and that he was just joking about wanting the shortest leg. I think I'm going to run leg 1 - 6.83 miles - this way I can kick off our team run and my team mates, who are probably all faster than I am, can make up some time on the other legs of the run. I'm also excited about running the first leg of the race because I'll be able to meet up with my running group gals! They are all running the half marathon, so I know it will be fun to be with them for the first half of their run. The girls have joined the half marathon training group with the Running Spot, so they're out there in this January cold weather already pounding the pavement. I'm very tempted to join the group also, even though I'll be running 7 miles and not the full 13.2. Being part of the group motivates me to show up at the group runs and push myself when I'm out running. I'll keep you posted if I decide to join. What's not motivating me right now are the cold temperatures in Cincy - it's snowy, windy and icy and that just doesn't sound like a fun way to get back into running. But I've stocked up on some cold weather running gear, so I just need to bite the bullet, lace up my shoes and hit the ground running (again, pun intended). I'll be using Cincyspin to track my progress with my running this year. I also plan to load up the Dolce more often once Spring rolls around and hit the bike trails. So, cheers to making the commitment - I hope it's a fun & healthy year filled with bike rides, running events and maybe even some yoga! 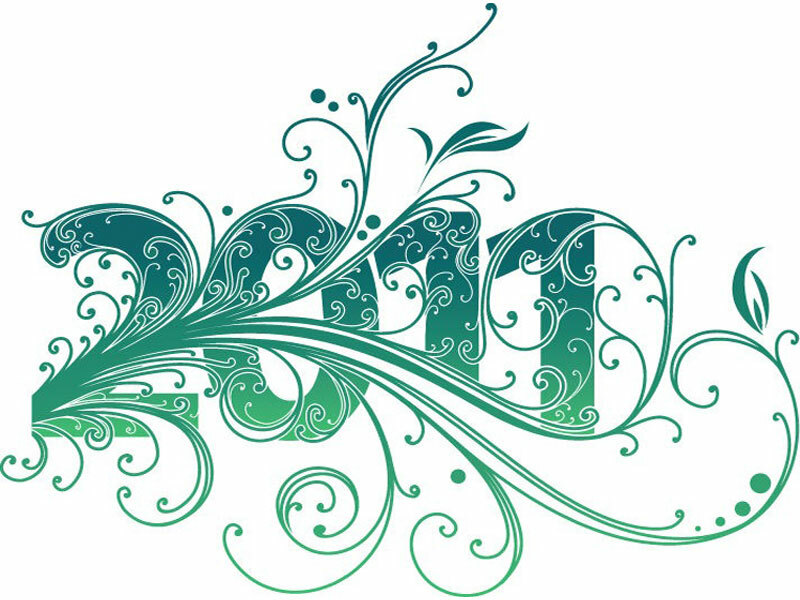 Cheers to a new year - 2011 is here! This time of year can really be inspiring. The obvious is making the New Year's resolution, which some people say they don't make because they don't want to set them selves up to fail on the first day of the year. Many people set up goals around this time of the year and succeed in accomplishing them - so when ever the time of year - I say go for it and make it happen. Cheers to a great start for 2011 - I hope this year brings you many days filled with laughter, love, adventure and happiness. Best Wishes for an awesome year ahead from CincySpin!